Hurricanes are unpredictable. We are at war with Mother Nature, but we have no ability to control her. We are uncertain of what is going to happen and that is what scares us the most. This hurricane is serious. We started to hear about it in the beginning of the week and to be honest I didn’t take it very seriously at all. Being a Floridian my entire life I know how unpredictable hurricanes are and didn’t want to start panicking until I was sure it was coming for us. It seemed like a hurricane day that we used to get as children and I maximized the time I got to be outside. Then Hurricane Irma made it known that she was coming straight for us and the reality of what could be started to sneak in. As a state we began to prepare by boarding up and escaping North when we realized the magnitude of her. Buying all we needed for just in case scenarios and bunkering down for what could be a few days of this. Gas and water became limited. Plane tickets skyrocketed in cost and the highways were crowded with everyone trying to leave. A violent hurricane coming towards your home really makes you change your perspective on everything. The small petty things in life disappear. The things that truly matter are what becomes your main priority; family and friend’s safety and getting through this. We are all in this together. With 120 mph winds and a storm surge that is estimated from 9 to 12 feet, this hurricane is no joke. Our eyes are glued to the news to be aware of what is happening while also praying that she shifts direction. Most of the city had to evacuate their homes. My family and I evacuated yesterday to Golisano Children’s Hospital, which has become a shelter for over 3,000 people and approximately 200 animals. The doctors, nurses and staff are doing all they can for everyone. Strangers are becoming friends. Friends have become family. We are looking out for one another because we understand the worry that is in all of our hearts. Our actions are us trying to remain calm and comfort each other, but the fear in our eyes and our loss of words show what is truly in our hearts. The animals can feel it and I could see in their eyes their frightened spirit. We are all in this together. We all took refuge & are here to support each other. 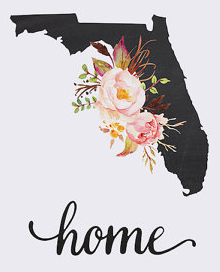 I have lived and grown up in southwest Florida, this is my home. My family and friends are here. Florida you’ll make it through this! You are a lot more stubborn than most states and I know you’ll not let a hurricane with the name Irma take you down. All we can do is be as positive as we can. Hope for the best and when this is all done help those where needed.